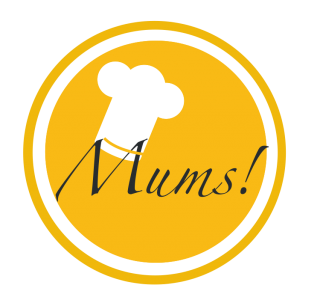 Truffled tagliatelle with king oyster mushrooms – Mums! Homemade pasta is not only delicious. It’s a fun way of involving your kids in your cooking. My girls love helping me with rolling out the dough. And I must admit, they master it quite well. Form 200 g grade 00 flour into a volcano. Into the crater, add 2 egg, 1 tbsp olive oil and a generous pinch of salt. From the middle of the crater, carefully work the flour into the liquide without destroying the walls. Add a few tablespoons water, if necessary. Once you have a dough, knead it for a quarter of an hour until elastic. Set aside for at least 30 minutes before continuing. Divide the dough into eight pieces. Using a rolling pin or a pasta machine, roll it out thinly. I prefer thickness 4 on the KitchenAid pasta roller. Let your sheets dry a bit and then cut them into tagliatelle. Boil the tagliatelle in salted water for a couple of minutes. For the sauce, bring finely chopped mushrooms and cream tasted with truffles and salt to a simmer. Add the quickly boiled tagliatelle and give it a good stir. Add chopped fresh parsley. In the meantime, sear sliced king oyster mushrooms in some olive oil. Taste with salt, lemon juice and more parsley. Serve the fried mushrooms on top a nest of pasta. I served this dish as the primo piatto in my seven course tasting menu. I also use that proportion for my pasta: 100 gr 00 flower = 1 egg; 200 gr = 2 eggs; and so on. But I do not use oil at all. Water only if needed. It depends on the size of the egged usually. In that case, I’ll need to try making pasta without adding oil. Thanks for sharing!